For more than 150 years, the name Singer has been almost synonymous with the sewing machine. The first Singer sewing machine appeared on the market in 1851. By 1859, the first treadle machines were sold. In the 1920s Singer introduced the first electric machines. With the growth of Home Economics courses in school, Singer created the Scholastic line. Today, the Scholastic line is still used in sewing classes all over the world. These machines are designed to be simple to use. The Scholastic 717 was offered on the market in 2003. Place the spool of thread on the spindle on the top of the machine. Pull several feet of thread from the spool. Hold the thread between the finger and thumb of both hands. Pull the thread taut with your hands about 4 inches apart. Lower the taut thread over the tension knob. Make sure that the thread slides between the two tension discs. Pull the thread in the right hand down so that the thread catches under the thread guide on the right side of the tension knob. Pull the thread in the left hand down. It will remain over a small wire loop on the lefthand side of the tension knob. Slide the thread under the thread guide on the left side of the tension knob. Release the thread with both hands. Turn the hand wheel on the far right side of the machine until the take-up lever is at the highest point. The take-up lever is the silver lever with a hole that goes up and down when the machine is running. Thread the end of the thread through the hole at the top of the lever while the take-up lever is at the highest point. Turn the hand wheel again so that the needle drops. At the top of the needle housing is a small metal spiral. 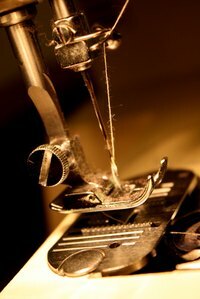 Slip the thread through this thread guide. Turn the hand wheel a final time until the needle is at its highest point. Push the end of the thread through the eye of the needle from front to back. Licking or waxing the end of the thread holds the fibers together and makes it easier to push the end through the tiny eye of the needle. Always use care when your fingers are near the needle of a sewing machine.